A number of politically-based documentaries are set for releases that will coincide with the November 2004 presidential election. 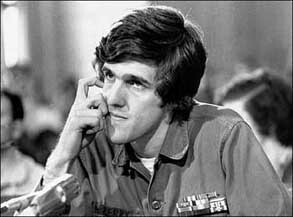 One such film is George Butler’s Tour of Duty, which will follow Douglas Brinkley’s non-fiction book about John Kerry’s naval tour of duty in Vietnam, his period of peace advocacy that followed, and the ways that both eras of his life helped to shape the man as a politician. Butler’s previous documentary work includes Pumping Iron, a movie about a bodybuilder with designs on acting. That bodybuilder was Arnold Schwarzenegger, and the film made him a household name long before he had any sort of political aspirations or even real fame. Additionally, Butler found some critical acclaim with The Endurance: Shackleton's Legendary Antarctic Expedition, a retelling of Sir Ernest Shackleton’s ill-fated exploration of Antarctica from 1914-1916. Amusingly, Butler had about 40 hours of footage in the can on Kerry, a personal friend whom he had known for nearly 40 years, when he ran out of funds and had to put the project on hiatus. Shortly after Kerry won the Iowa caucuses, Butler had plenty of new-found investors and was able to progress with production. See the latest developments for this project on the Going Upriver: The Long War of John Kerry Movie News page.